Andrew Furlong is an upright and electric bass player and an active member of the Toronto music scene. He has performed with Ken Aldcroft’s Convergence Ensemble, The Holy Gasp, Skye Wallace and Delusions of Grandeur. He is a member of Mark Hundevad’s Archives of Eternity project, Patrick O’Reilly’s Chalk Repairer, and leads misfit-jazz band My Misshapen Ear with Joe Sorbara and Anthony Argatoff. Andrew’s patient, physical solo performances are the forefront of his artistic practice. He can be found improvising in small groups with some of Canada’s most creative musicians in Toronto and across North America. Andrew has composed music for solo double bass, jazz trio and quintet, as well as a 15 minute piece for large improvising ensemble, premiered at the 2016 University of Toronto New Music Festival at Walter Hall. His duo with trumpeter Emily Denison, Doit, will be released December 2018. 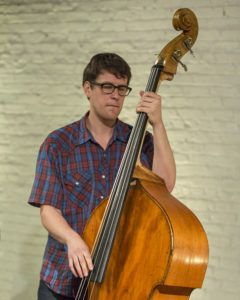 In July 2018 Andrew received the Chalmers Professional Development Grant from the Ontario Arts Council to study with bassist Mark Helias in New York City.